Magnet Implants: Sixth Sense or Nonsense? 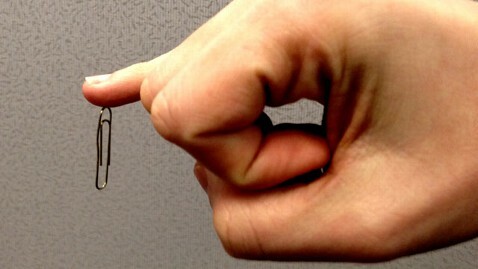 Dann Berg's magnetic implant allows him to pick up paperclips with his pinkie. Photo credit: Dann Berg. As superpowers go, sensing the electromagnet waves given off by a microwave or computer may not be quite as impressive as flying or a cloak of invisibility but it is a power that is literally within anyone's grasp. All it takes is a magnet implant in your fingertip. New York City writer Dann Berg decided to get a magnet implant about three years ago after reading about the trend online. The article described an implant gone wrong complete with graphic images of a magnet decomposing under flesh. Initially put off by the gory details, he decided to go for it anyway after finding out a buddy of his had it done with no ill effects. "I had a curiosity to explore the world in a completely different way," he explained. Berg said the implant procedure, performed by a body piercing specialist, was quick and extremely painful. Only a medical practitioner can give injectable anesthesia, so Berg had to grin and bear it while the technician sliced into his right pinkie with a scalpel, slid a disc-shaped "rare earth" magnet into place and then sealed the incision with some surgical glue. It took a few weeks for the numbness and swelling to subside, but Berg said he could pick up paper clips and safety pins with the magnetized digit almost immediately. Gradually his finger began to develop a "sixth sense" around any object that gave off electromagnetic waves. "There is a half dome of vibration that surrounds the object almost like a tennis ball cut in half," he said. "The vibrations vary in strength depending on where I hold my finger and it's almost like the finger itself is vibrating against an invisible field of energy." As Mark Fenske, a neuroscience researcher at the University of Guelph in Canada explained, there's really nothing magical about magnet implants. "A strong enough magnet will respond to changes in electromagnetic fields, which occur anywhere you have fluctuations in electrical current or movement of another magnet. Placing a magnet in the finger takes a form of information that normally isn't readily sensed by touch and converts it to movement or vibration that is readily sensed," he said. One experience he quickly learned to avoid was having the magnet spin around inside his finger. "An outside magnet with a different polar pull can cause my magnet to make a quick flip inside my finger. It doesn't hurt but it is fairly uncomfortable," he noted. The only other minor inconvenience he's experienced is when the magnet pulls off to one side and sits on its edge instead of lying flat against his finger. But so far he hasn't set off any security systems, demagnetized his credit cards or trashed his smart phone. Berg admits his fingertip magnet doesn't have any practical applications unless you happen to work in a profession where telling the difference between a live wire and a dead one is important. But he likes the idea that his "bio hack" is a compatible part of his body rather than something he wears. Also, dangling small magnetic objects from his little finger is a fun party trick, he said.